Where in the World? Lake Michigan, That’s Where! Lily and Emmy can play in the sandbox at our playground for hours. They don’t even need real sand toys, just a stick and their hands will do the trick. So imagine their delight when we hit the beach! My extended family has rented houses close to the beach one week out of every summer for as long as I can remember. It’s a wonderful family tradition that I love. The lakes and houses have changed over the years, but we have always met in Michigan. This Lake Michigan beach is the one our family has come to for the past twenty or so years. I just love the dunes and the water and the beaches of Lake Michigan. Just look at those chubby cheeks and chunky arms! (Ahem — look at the baby’s chubby cheeks and chunky arms!) Lily’s first trip to the beach was in 2005, and she loved everything about it. I can’t believe this chunky little baby will be graduating from preschool today! Emmy’s first trip to the beach was not quite the same. She hated the sun screen, the sand in her eyes, the sand on her legs…and then her Uncle J took her out in the water. She LOVED the water! Emmy was not quite a year old on her first trip to the beach in 2008. Last summer, both Lily and Emmy just loved playing in the sand and the water every day. 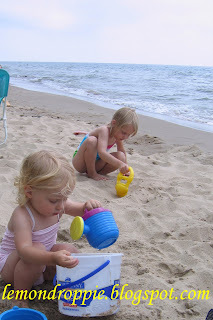 We spent hours at the beach playing, walking, swimming, and picnicking. This summer, we are breaking with tradition and having our family reunion in the mountains, so we’ll be doing our swimming at the neighborhood pool instead. I’ll miss the beach, but we’ll go back someday. Where in the world are you? Link up below! The suggested theme for next week is: YOUR OWN BACKYARD! Show off what’s right outside your door! What do you love about your backyard? Is your backyard an oasis or an eyesore? No backyard at all? Come back next week and share with us! 10 Responses to Where in the World? Lake Michigan, That’s Where! Way cute pictures! :)I'm a beach girl myself. Love, love, love the beach! But the mountains are equally as beautiful and I hope you have a great visit! I went to the Indian and Michigan dunes all through my High School years. Growing up I spend all summer at the beach in Union Pier, MI. Look at those cute girls! And cute grownups too! The linky showed up for me after I posted my previous comment….I'm linked up now. Great pictures! We go to a "beach" along the Tennessee River here, but it is nothing like a real beach. 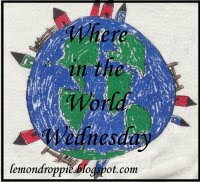 We haven't been to the ocean since 2004 and I really miss it.I forgot about the beach theme, but here is the link to my Where in the World Wednesdayhttp://ourfullnest.blogspot.com/2010/05/where-in-world-wednesdayworlds-fair.htmlI'm not seeing anywhere to link up. Sticks are good for digging with. So are silver teaspoons and plastic mugs. At least I thought so, my Mum wasn't too sure! I wrote about the beach today too! We love the beach anywhere – and B is actually more comfortable at the lake because of the calmer waters (and so is is mama). We're headed to a local lake this summer – I've already started packing! How fun does all that look! I love the pictures of the kids with their big fat cheeks! My kids haven't been to the beach yet, I hope we can take them someday. What great memories!